A petition to rescind the invitation extended to US President Donald Trump for an official state visit to the UK has reportedly been rejected by the British government – despite gathering more than 1.1 million signatures. A spokesman for Prime Minister Theresa May said the UK has made it clear to the US that they disagree with their recently implemented travel restrictions, but that the countries have a strong relationship and will continue to work together, reported Reuters. An online petition asking for the official state visit of President Trump to the UK to be cancelled “because it would cause embarrassment to Her Majesty the Queen,” has gathered more than 1 million signatures. A threshold of 100,000 is required for the British parliament to consider debating a motion. “America is a huge important ally. We have to think long term,” a Downing Street source told the BBC. 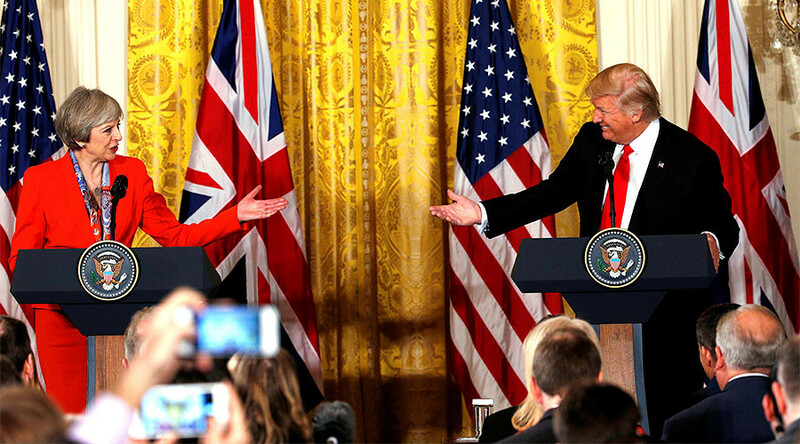 The BBC source reportedly said a rejection of Trump’s state visit would be a “populist gesture” and would “undo everything.” UK Prime Minister Theresa May announced Trump’s visit to the UK during her visit to the White House last week. No date has been set for the visit, expected to happen during 2017. The petition originally began after Trump was elected in November 2016, but gathered pace over the weekend following the announcement of his ‘Muslim ban’ executive order on Friday. He tweeted Sunday urging people to support the petition. Former Labour Leader Ed Miliband said he will call for an emergency debate on Trump's 'Muslim ban' in the House of Commons, but did not say if this relates to the latter's state visit to the UK.